Old Masters Brush Therapy gently cleans and moisturizes your brushes simultaneously, leaving them supple and easy to reshape. Handmade with 100% natural ingredients, Brush Therapy contains no detergents, fillers or harmful chemicals. Directions: Wet your brush and sweep the bristles across the top layer. Lather, rinse and repeat for heavily soiled brushes. 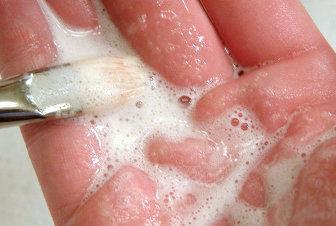 Be sure to use gloves if any brushes have been soiled with solvents, harmful pigments or chemicals. Tip: Recycle empty containers as palette cups, charcoal cases and pastel tins. Copyright 2019 Old Masters Maroger. All Rights Reserved.